Submitted by via facebook on Sun, 21/02/2016 - 01:00. I have just received this by email. 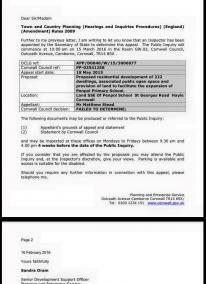 Does anyone know if you can comment on councils site or do you have to attend the meeting? Stephen Cornish I know from another application that there will be a consultation page on government's site. I think. Gill Baron I think you can only comment on an Appeal if you wrote in originally. Hope someone can confirm that. Tyrone Homes No, anybody can register and comment on the Council's Online Planning Applications System while the application consultation period is still open. Gill Baron I think it is different for an Appeal. 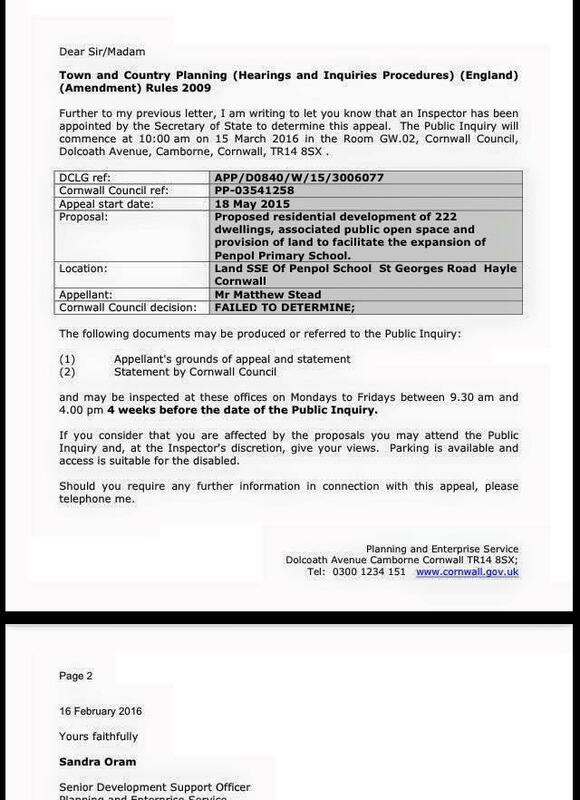 Graham Coad This a planning appeal though. I am going as mayor, if you wish to speak you must register on the first day. Donna Irwin Can we attend this meeting? Tyrone Homes Ah good point - i hadn't spotted it was an appeal. Laura James I wrote in originally which is why I think I got sent this. Actual letter has my name and address at the top. Doesn't give me an option to write or comment on planning page so I'm assuming I have to attend? Gill Baron Yes, if you wrote in originally you can make further comments. Gill Baron Certainly by writing in.